This page is just to have some documents scanned so I can link to them easily. Also text in posts are just to link or copy them in an easy way to other websites where I do my fundrising for Digital Art. Have fun worldpress travelers, or ‘slubber‘ it! 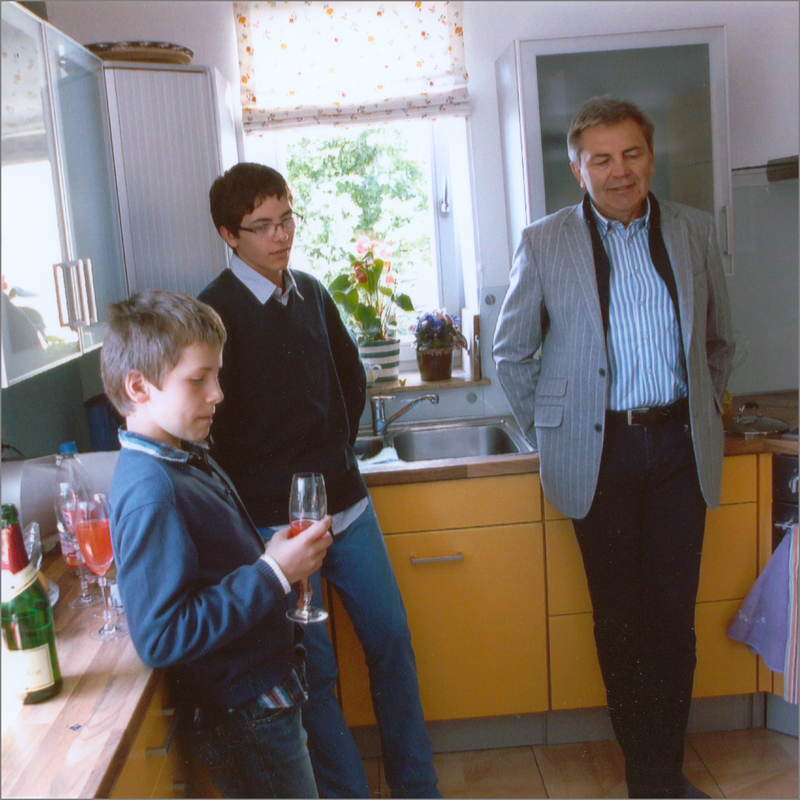 picture (2012): Max, Georg, Reiner in discussion about The Restaurant At The End Of The Universe. Is it located off the shoulder of Orion next to the Tannhauser Gate or somewhere hidden in Saxony, maybe in Freiberg, Obergasse 1 where I once developed the ‘Cybermedia’ standard [now McAfee], licenced to Gigabell [the sun rises two times], and the center of ‘Human Interface Design’? Some things may begin with an unlucky spell in life. I was often daydreaming in the math lessons at school. 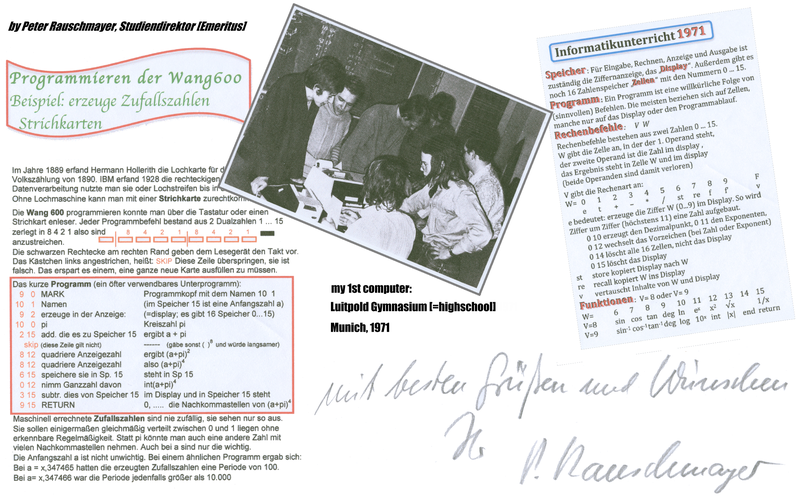 I needed urgently to find a way ‘to work around’ and found it in 1971 in programming the WANG 600; thanks to my math-teacher Peter Rauschmayer. 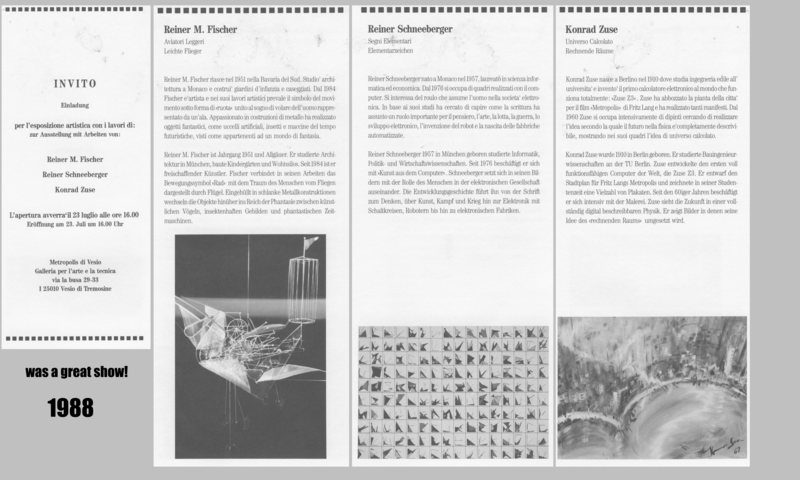 In 2012 I offered a workshop ‘PRIMEXPLORER’ for kids aged 11 to 14 at ‘Rudolf-Hildebrand-Schule’ as a sort of personal ‘flash back’. Enjoy the result in this PDF [takes a while to load]. Max was the youngest participant 10 years old. Let´s enter the ‘Draft Universe‘ that The Russian writer Sergey Lukyanenko describes in his books ‘Weltenwächter’. Let´s give young programmers control. They have the potential. Art & technolgoy finds to an interaction. Konrad Zuse, known as the inventor of ‘the computer’ was a painter in heart. Our mind is about to take control in a – we called this in the past – ‘a telepathic way’. I announced mind controlled software-machines at the Liveperformers festival in Rome 2013. The Mondrian3 art machine is about to be launched next. The 21th centrury is about to gain knowlegde in ‘Randomness’, the art is ‘in the code‘.